The Jio phone is probably the best in the market when it comes to the services it provides and the price it is available for. The phone had many features but lacked one. But there is news coming in that Reliance's Jio phone may soon get WhatsApp. Reliance came up with its Jio Phone last year. The phone was launched at an effectively free price. The Jio phone was launched at Rs 1500 with a cash back guarantee of the complete amount in case you return the device to its original condition after using it for 3 years. The phone was specially designed to expand Jio's reach to broader sections of the Indian society. Jio's all 4G network doesn't support 2G and 3G smartphones and a large number of Indian population still don't carry a 4G smartphone. Keeping this in mind, Jio came with a basic mobile phone running on Kios that is based upon Linux operating system. The phone has its own Jio store to download various apps and games, the phone also comes with an inbuilt browser that lets you stream videos on the youtube. As per WABetaInfo, a tracker of upcoming WhatsApp features, "references to a native KaiOS app" have been spotted in the latest beta commits to WhatsApp for Windows Phone version 2.18.38. However, it should be noted that there have been no official announcements from either Jio or from WhatsApp. Finally, it seems that the much-awaited WhatsApp support may be making its way into feature phones. Presently, WhatsApp is supported only on Nokia S40. However, that support will end in 2018. It is interesting to see WhatsApp coming on KaiOS, because this is in stark contrast to the company's approach of shutting its doors for old phones. Following WhatsApp, other instant messaging apps may also take this route. 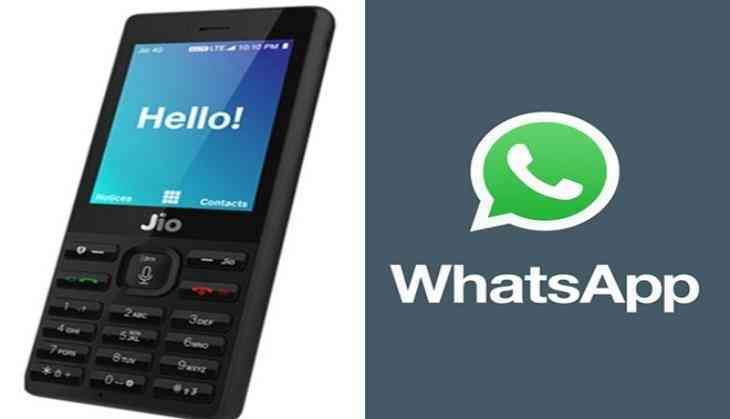 Also, the introduction of WhatsApp to the Jio Phones may see a stark increase in the sales of the device that has now been limited to the comparatively low-end users.